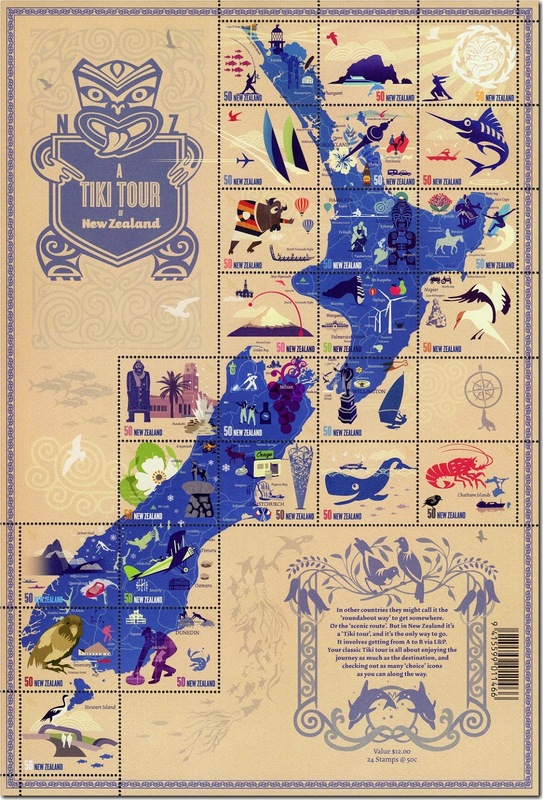 Virtual New Zealand Stamps: 2009 - A Tiki Tour of New Zealand. No. 1. A Tiki Tour - "In other countries they might call it the ‘roundabout way’ to get somewhere. Or the ‘scenic route’. But in New Zealand it’s a ‘Tiki tour’, and it’s the only way to go. It involves getting from A to B via L&P®." Getting off the beaten track, visiting places, seeing things that would normally be overlooked. 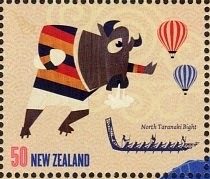 This stamp issue sets out to show the different sights and activities that can be enjoyed in New Zealand. For such a small country there is much to see; from majestic mountains to flat open plains; from a bustle of modern cities to small country towns; from the roar of an ocean beach to the stillness deep in a forest glade. No matter what interests you, New Zealand has something to offer. New Zealand is a sporting nation with rugby being the national sport but many other sports are popular too. You can swim in the ocean then a few hours later ski down a mountain. Fishing, sailing, horse riding and mountain climbing are among the activities shown here. Go whale watching or watch an air show of vintage aircraft. Activities are almost endless but when you have finished what better way to end your day than to relax in the natural hot water of springs such as those found at Hamner Springs or many other hot pools found throughout both main islands. Enjoy some of the best wine in the world with a meal of roast lamb or fish, freshly caught from the sea. The choices are limited only by your imagination. While being a young country, New Zealand still has a rich history. 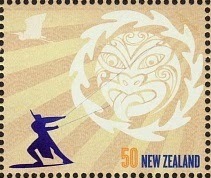 There are the Maori myths and legends such as Maui capturing the sun or the tragic love-story of Pania of the Reef. Timber milling, gold mining and breaking in the land for farming, stories of courage and determination remain of those first Europeans. Almost every town has it own little museum telling the stories of the local area. So come with me and enjoy out Tiki Tour through New Zealand. 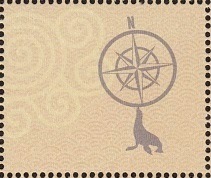 on these stamps, we have cut them out so I can write about each stamp. 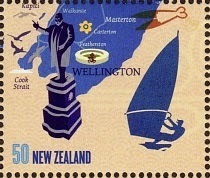 50c - Cape Reinga / Kaitaia / Waitangi. We see the signpost at the top of New Zealand pointing to other parts of the world. There is the famous Cape Reinga Lighthouse. On the left is Ninety Mile Beach popular for surf casting fishing. On the right is the Bay of Islands with the historic Stone Store at Kerikeri and the feather pen making the signing of the Treaty of Waitangi. 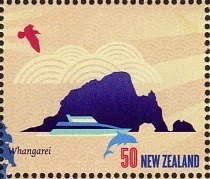 50c - Cape Brett / Piercy Island / Whangarei. 50c - Maui snaring the sun. This is one of the amazing feats of the mythical Maui. In this legendary story the sun used to race across the sky in only a few hours giving the people very little daylight time. Maui sets out to capture the Sun and persuades it to slow down as it crosses the sky giving the people more time for the many things they needed to do each day. 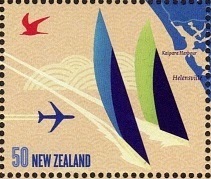 50c - Kaipara Harbour / Helensville. To the north of Auckland lies the Kaipara Harbour is one of the largest harbours in the world. It covers 947 square kilometres (366 sq mi) at high tide, with 409 square kilometres (158 sq mi) exposed as mudflats and sandflats at low tide. A place of safe waters and excellent fishing but protected by a dangerous sand bar at the harbour mouth. On this harbour are the sister towns, Dargaville in the north and Helensville in the south. 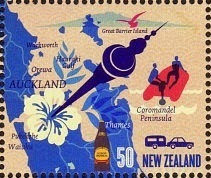 50c - Auckland / Coromandel Peninsula. 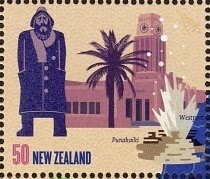 There is a lot on this stamp, the main attraction being Auckland City and the Sky Tower. To the north can be seen the attractions of Warkworth and Orewa, both holiday locations. Off the coast is Great Barrier Island, a really out of the way place to visit, and the holiday area of the Coromandel Peninsula. Notice the bottle of L&P (Lemon and Paeroa) a popular soft drink in New Zealand. 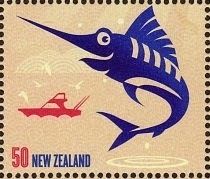 Off the east coast of the North Island the Marlin, an aggressive sporting fish, can be found. 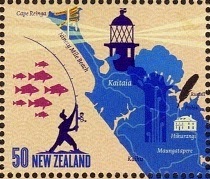 The stamp shows the Marlin jumping with a fishing boat in the background. This fish is very good eating, well worth the struggle it takes to catch one. 50c - North Taranaki Bight / Waikato Rugby. 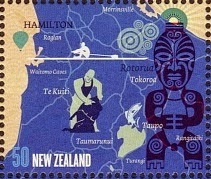 The stamp shows the emblem of the Chiefs, a professional rugby team based in Hamilton (see next stamp). Hamilton is also famous for it hot-air balloon festival held each year. This is where the Tainui canoe is said to have landed which many Maori in this area trace their ancestry back too. 50c - Hamilton / Te Kuiti / Rotorua / Taupo. 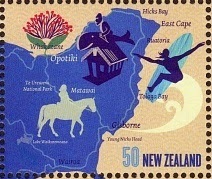 This stamp shows the Waikato and Bay of Plenty regions of the North Island. The City of Hamilton is at the top with Tauranga to the right. Further south is Rotorua and Taupo. Attractions shown include the Waitomo Caves, rowing on the Waikato River, sheep shearing in Te Kuiti and fishing in the large Lake Taupo. We must also mention Rotorua with its famous tourist attractions. 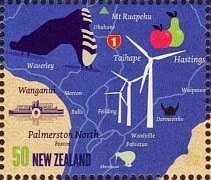 50c - Bay of Plenty / Gisborne. The flower is from the Pohutukawa tree found in the northern half of the North Island These bright flowers cover the tree at Christmas time, making it known as the New Zealand Christmas Tree. This is East Cape, the eastern regions of the North Island. Attractions shown are horse riding and surfing. The movie Whale Rider, based on another Maori legend was filmed in this area. 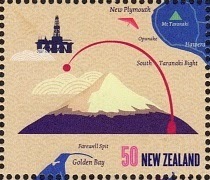 Taking centre stage on this stamp is the beautiful Mt Taranaki, almost a perfect cone from some points. Taranaki was primary a farming area, dairy mainly, but since oil and gas was discovered offshore, a new and exciting industry has been driving the economy of the region. 50c - Wanganui / Palmerston North / Hastings. 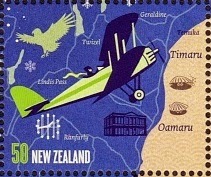 This stamp covers a lot of the lower/central North Island from Taranaki in the west to Hawke's Bay in the east. Attractions include the central mountains around Mt Ruapehu, fruit growing in Hastings and the Taihape gumboot. Centre place are the giant wind turbines from the wind-farms near Palmerston North. 50c - Napier / Hawke's Bay. Hawke's Bay - the fruit bowl of New Zealand. The warm climate makes this an ideal place for growing many types of fruit. Napier and Hastings are the two main cities of this region. 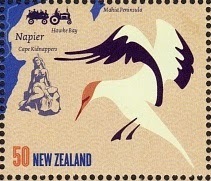 Cape Kidnappers with its Gannet colony is also shown. The statue shown is Pania of the Reef. See our post on this tragic love-story. 50c - Punakaiki / Westport. We now move on to the South Island to the town of Westport on the western side of the island. The statue of a tribute to the fishermen from this port who brave the wild ocean each day. Punakaiki Rocks, also know as Pancake Rocks is shown too. 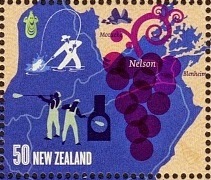 50c - Nelson / Blenheim. At the top of the South Island Nelson and Blenheim can be found. Tourism, Agriculture & Food (Wine & Grapes) are the attractions here. The beautiful Marlborough Sounds is an amazing boating playground with many hidden coves and beaches. 50c - Cook Strait / Wellington. Here is Wellington which surprisingly is further south than some parts of the South Island. Located at the bottom of the North Island and top of the South Island, it was thought to be the ideal place for New Zealand's capital. The statue, that stands in front of Parliament Buildings, is of Richard John Seddon, New Zealand’s longest serving Prime Minister. He was Prime Minister from 1893 to 1906. Opps! It was only when I came to write about this stamp I realised it isn't a real stamp. Its got no value! Anyway its here now as a "Collectors Item" LOL. 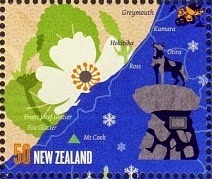 50c - Greymouth / Hokitika / Mount Cook (Aorangi). Westland is a narrow strip of flatter land between the mountains of the Southern Alps and the Tasman Sea. Two larger towns of this region, Greymouth and Hokitika are shown here. The highest mountain in New Zealand, Mount Cook (Aorangi), is also shown along with the beautiful Mount Cook lily. 50c - Hamner Springs / Christchurch. On the other side of the South Island are the Canterbury Plains and the beautiful garden city of Christchurch. This city was hit by an earthquake on the 4th September, 2010 when amazingly nobody was killed. A second large earthquake hit the city on 22nd February 2011, this time much more damage was done, 185 people were killed and many fine buildings damaged or destroyed, including the iconic Christchurch Cathedral. Hanmer Springs is a popular tourist destination for bathing in the hot springs that were produced by the fractured rock bed along the Hanmer fault. Look at that cute whale. He seems very happy! Maybe he knows those people in that boat are just out to photograph him, not hunt him. 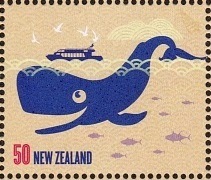 The hunting and killing of whales is illegal in New Zealand. Way out east of New Zealand is the Chatham Islands. The Chatham Islands form an archipelago in the Pacific Ocean about 680 kilometres (423 mi) southeast of mainland New Zealand. It consists of about ten islands within a 40-kilometre (25 mi) radius, the largest of which are Chatham Island and Pitt Island. 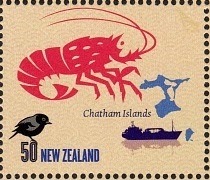 Most of the Chatham Island economy is based on fishing and crayfishing, with only a fragment of adventure tourism. 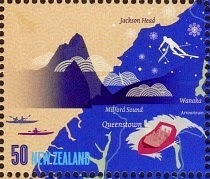 50c - Wanaka / Milford Sound / Queenstown. Wanaka is famous for its beautiful lake and air show, while on the other side of the mountains is the spectacular Milford Sound with the much photographed Mitre Peak. 50c - Timaru / Oamaru. 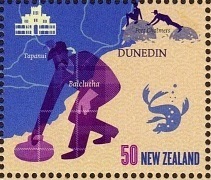 Between Christchurch and Dunedin are the two smaller port/towns of Timaru and Oamaru supported by the farming industry of the southern Canterbury Plains. The vintage aircraft shown is from the air show "Wings over Wanaka" held at this lakeside town of Wanaka. 50c - Te Anau / Invercargill. 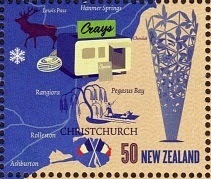 This stamp shows the south-western corner of the South Island including Te Anau, Invercargill and Fiordland. 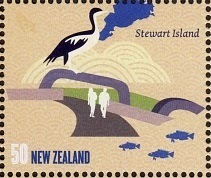 Part of Stewart Island is also shown, see the last stamp below. 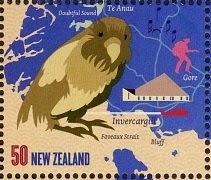 The bird shown is a flightless owl/parrot, the Kakapo. Because of Polynesian and European colonisation and the introduction of predators such as cats, rats, ferrets, and stoats, the kakapo was almost wiped out. Now the kakapo is considered to be critically endangered; as of March 2014, with an additional six from the first hatchings since 2011, the total known population is only 126 living individuals, as reported by the Kakapo Recovery programme, most of which have been given names. 50c - Dunedin / Balclutha. Dunedin is the second largest city in the South Island, an old city by New Zealand standards having been settled by Scottish immigrants in 1848. Even today it proudly retains its Scottish heritage. Further north at the location of Moeraki are the famous large round boulders that can be found on the nearby beaches. The sport shown is curling that is played during the winter on the ice of frozen lakes and ponds. Stewart Island / Rakiura is the third-largest island of New Zealand. It lies 30 kilometres (19 mi) south of the South Island, across Foveaux Strait. Its permanent population is 381 people as of the 2013 census, most of whom live in the settlement of Oban. Much of the island is now protected in various conversation reserves and parks. I did enjoy your writing here. I know some you copied but other parts were truely you.